The recordings John Coltrane made for Prestige, both with and without Miles Davis, helped establish his first substantial foothold in the jazz world. He showed that he could play the blues; and whether he was treating a ballad at the usual tempo or taking one upstairs, he combined thought and emotion in a completely individual manner. 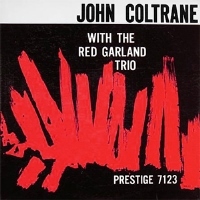 The Red Garland trio, itself a recording entity for the label, was a strong unit that was sensitive to Trane's musical attitudes. The absence of any unessential instrumentalists encourages a decidedly concerted focus from Coltrane, who plays with equal measures of confidence and freedom. In 1961 this album was reissued as Traneing In, Prestige catalogue 7651, and given a different cover. One of the essential albums for fans of John Coltrane! Recorded August 23, 1957 at Van Gelder Studio, New Jersey. Mono. Originally released by Prestige (PRLP 7123). This reissue released in 2013 by Analogue Productions.